great projects today... i follow both blogs thanks for sharing and the chance to win. Very nicely done, gr8t job showcasing the stamps! 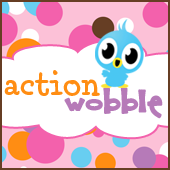 Action Wobbles work so well with these stamps. I follow both blogs.